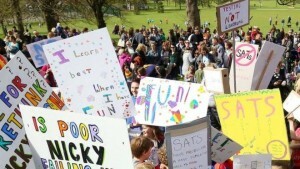 There has been quite a heated debate in the news about primary school tests for seven-year old’s. I do ask myself how they managed to gauge the success of the school in my generation when we didn’t have any primary school tests until we got to secondary school. I also don’t remember my eldest son doing these primary school tests either but, I do remember going to sit with my youngest son to do his primary school tests because he has SEN requirements and, therefore, I had to sit with him to do his test. I remember even I struggled to think of a couple of the answers for the maths questions so, with him with special educational needs, there’s absolutely no way he was going to be able to perform under those conditions anyway. The pressure and the alien environment of a quiet school room for the test to take place was going to be enough to put him off achieving anything that morning. On another occasion he was asked not to attend on the day they did his primary school tests so how could this give an accurate reflection of that school’s performace? I ran a very successful preschool nursery for children from 0 to 5 for seven years. When I first opened, most of the activities we did were play based. The children were able to try things out and experiment allowing them to fail in an safe environment. This is how they learnt. We did number counting and we did writing too. The majority of our children could write their name and count way above 20 by the time they left the nursery. However, after being open a couple years OFSTED arrived and a new set of guidelines and rules were announced. This meant that everything we did had to be accountable for in writing. For instance, we did a Jack in the Beanstalk topic and that included the children growing their own plants. Every morning the children rushed in and couldn’t wait to water the seed because they knew that the seed needed water to grow. However, we were marked down because there was no written evidence that proved we knew the children understood this principle despite the fact the children themselves demonstrated at the inspection visit, they completely got that the seed needed water. The world’s gone mad! Needless to say after a couple of years of everything the children did having to be written down and explained in print – I gave up the nursery. 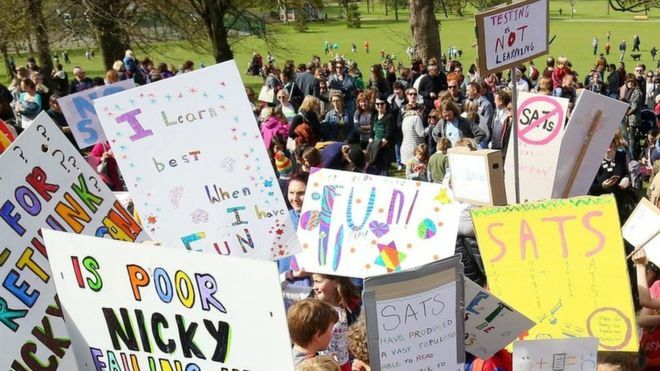 So with more than 40,000 parents signing a petition calling for a boycott of primary school tests due to be taken later this month, isn’t it about time us parents were listened too? Education Secretary Nicky Morgan says that taking pupils out of school “even for a day is harmful to their education” against the argument parents are making in that our children are “over tested and in a school system that places more importance on test results and league tables than children’s happiness and joy of learning”. Well said! If I was the Education Secretary, I would suggest that she look at more pressing issues in our schools like class size, if she is worried that certain children are being left behind who may not catch up later in life. Personally, I truly wonder if these tests are at all helpful to anyone? As the mother of a 4 year old daughter, I was astonished to see the new Chinese trend of proving that their waists are no bigger than a piece of A4 paper! 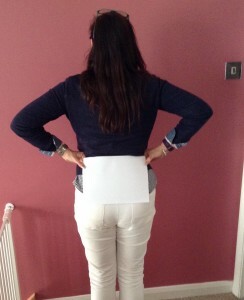 The trend has seen them trying to demonstrate their waists are equal to or narrower than the width of the average A4 paper we use daily in our printers. A4 paper is 8.2 inches or 21 cms. Girls have been posting these worrying results on the internet and Weibo, their version of twitter, in their thousands! Some even boasting they are smaller than an A4 paper being an A3! I do worry how a trend like this affects our daughters and the pressure it adds to their daily life. Anyone who knows me knows that I am a confident lady but, even I find it hard enough competing with air bushed celebs full of face fillers and Botox, plastered all over the front pages of magazines without being an impressionable teenager! We are being asked to live up to something that is impossible for us to attain. I can only hope that all the thousands of positive words I have given my daughter will make her self image one of her own and not one that will be forced on her by the next new trend! Whilst a tiny waist has been a long tradition in China, it is worth noting that they have a completely different build to us western ladies. Some ladies, like myself, have taken to humor and decided that we too can have an A4 paper size waist – just Landscape not Portrait! But lets look on he brighter side and have a bit of a laugh with this? Why not tweet us @createmebooks with your pic’s. All paper sizes welcome! Couple of articles you may want to read are below. I had to read them to believe it was true! Too Old for a Buggy? 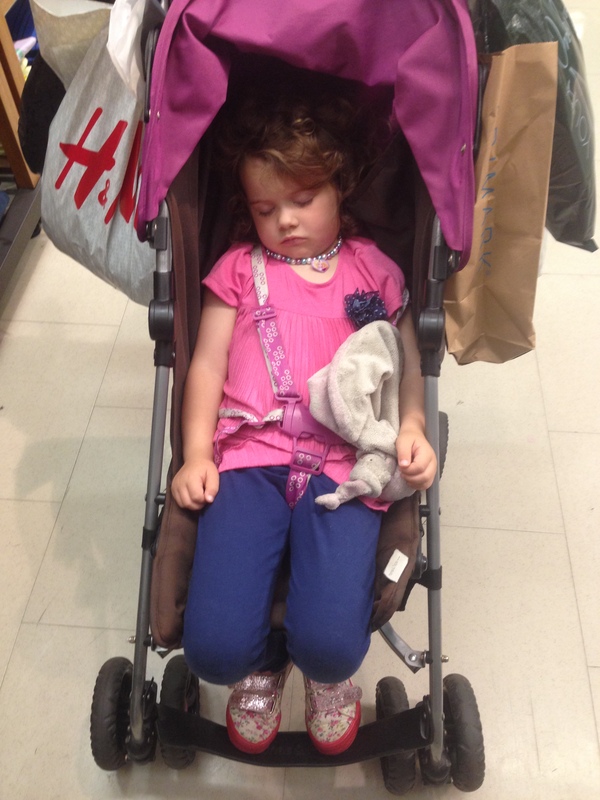 My 4 year old has been too old for a buggy for some time and walks everywhere with us. So when her buggy broke it never occurred to us to replace it. However, now we are off to London next week and we will be doing lots more walking and involving greater distances than I would expect my four year old to manage to walk in a day. When I realised this and the fact that following surgery, I am unable to carry her any distance, I gave the situation some thought. Originally, I thought I would just get her a new buggy for £35 from Tesco or Argos, as being a foster Mum too, it would be bound to come in useful at some stage. I did a google search to see what I could get and found this article along with several others. Defiant Mothers still using buggies for their 4 year olds. Firstly, I was shocked and now wonder how I am going to be judged whilst pushing my 4 year old around London. Is she really too old for the occasional buggy ride? I feel almost embarrassed and that I have to justify myself before I even leave home! I lived in London for 10 years and I know how far we are likely to have to walk whilst out and about meeting up with family. I just don’t think it is fair on her, and her little legs, to have to walk this sort of distance knowing that I can’t pick her up and give her a carry either. I can fully appreciate some of these explosive headlines but really – I’m just going to use mine for the one trip – honest!!! If you have experienced this dilemma, then don’t hesitate to get in touch. We would love to hear from you.